Discussion moved from the 3464 enclosure page. Dave Sigaty: I think that we have to distinguish between the cases where Black makes this enclosure when there is already a black or white stone along the left side and when there is not. 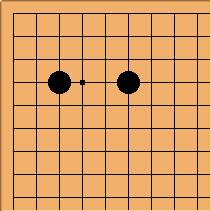 When the area in front of the enclosure is already occupied, the knight's move (keima) approach to the side may be normal. However, the enclosure exerts its (influence) to the front rather than the side, similar to the one-space high enclosure. 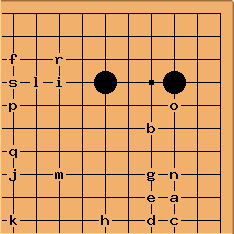 Searching the GoGoD CD with Kombilo for examples of this enclosure with no other stones in the quadrant shows that both Black and White tend to emphasize the area in front rather than on the side. In the 86 cases returned by the search, White plays next in front of the enclosure 54 times versus only 5 on the open side. White is quite a bit more likely to do nothing in this area and let Black play next than she is to approach from the side. In such cases, Black in turn more often develops in front of the enclosure than on the side. what do you mean by "front" and "side"? Charles Matthews Well, I have the same tools, and a database search with a different SubBoard will turn up somewhat different conclusions. That's one reason I want to pursue middlegame joseki and framework theory in this way, via what I posted as framework workshop. The initial comment was mine, based on older research on games on paper, mostly. And including more games from Chinese yearbooks. This enclosure has been back in fashion from about 1994/5. Of course if White here can easily get a group established on the side, in front of the enclosure, that's good. I wouldn't for that reason make my sub-board an otherwise empty 10x10 for this. There's an example at jabberwocks that is relevant. Anyway, let the debates continue. Initially it seems that 'each game goes its own way'. In the database era one can try to look a little deeper into techniques. tapir: This page confused me once. I didn't really get what the discussion was all about. Looking into my database, I tend to agree with Dave. With a short range search it looks like White approaches from the side more often, but if you look at the actual games it is almost universal when some development at the front side happened already.